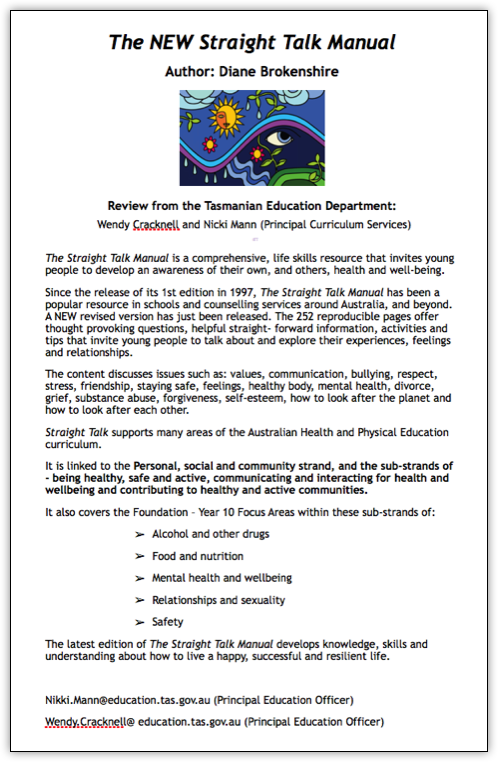 The Straight Talk Manual has been successfully used by teachers, counsellors, youth workers and families across Australia, Europe and America since first published in 1997. 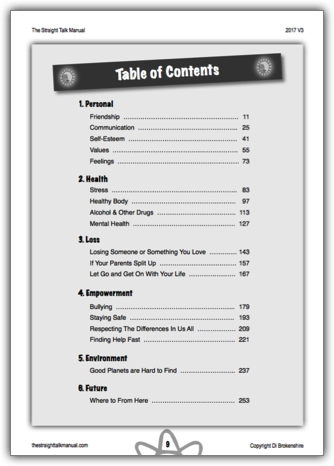 The Straight Talk Manual addresses important topics relevant to kids today. The manual includes 18 chapters offering important information, tips, quizzes, activities and colouring in pages. 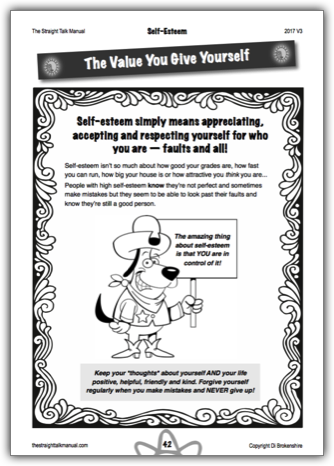 The New Straight Talk Manual invites young people to explore relevant and important topics plus their own experiences including feelings and relationships, values, stress, respect, healthy relationships, bullying, communication, forgiveness, grief, finding help fast, staying safe and sensitive family issues like substance abuse and mental health. Explore the 19 chapters. Start at the beginning or find an area of interest. Fun artwork for kids and teens - looks amazing when coloured in! 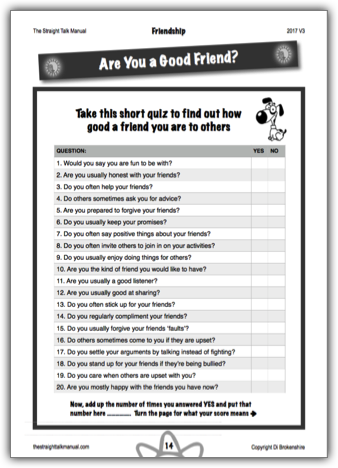 Worksheets invite and encourage kids to think about their experiences, feelings and relationships. 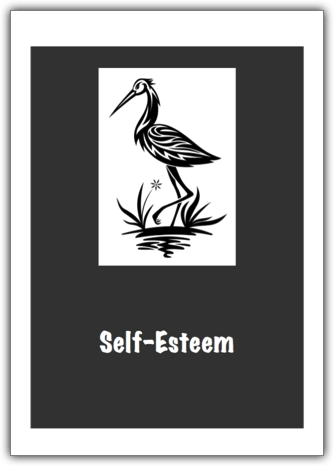 Self-scoring to reflect on who they are. Important topics to help kids navigate life. Information delivered in a fun ways. 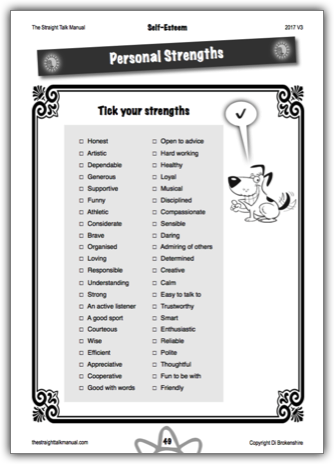 Activities for building important life skills such as discovering personal strengths. 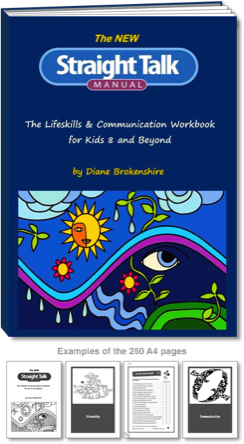 “I’ve used both The New Straight Talk Manual and Game in my work with children and find it such an amazing tool to have. Thank you so much for talking the time to re-develop these resources. I cannot recommend them higher enough to my staff and colleagues within the community services sector." 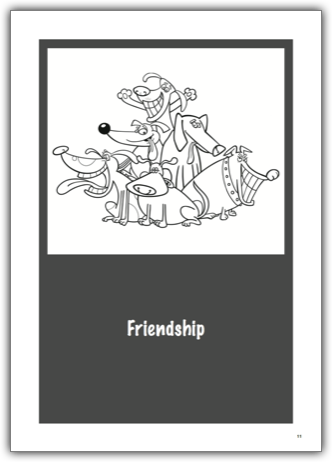 "The Straight Talk Manual has been a great tool for us and for our older kid's church. It is written in everyday, down-to-earth language, well set out and easy to copy for discussion groups. Thanks Diane!" "You'll be glad to know that two of our Mooroopna Primary Schools are benefiting from Straight Talk. We've been trialling a six week program with Grade 5/6 girls and have just completed week 4 and the girls are interacting beautifully. I bring along some very trendy gel pens and texts and the girls are engrossed in the intricate designs through out the chapters. It's a nice distraction for them as they listen and participate. I'm happy to report that we are loving 'Straight Talk' and the girls are reporting that they look forward to each Wednesday when we meet." Would you like to look inside The Straight Talk Manual? 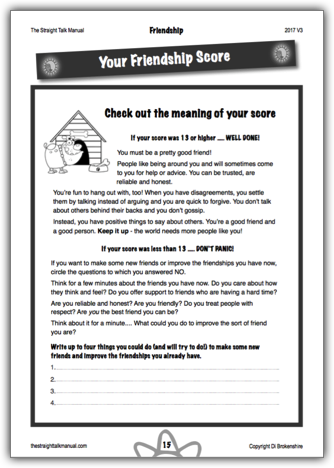 Download the free sample and try it out with the kids in your life!